Pakistani authorities vowed Tuesday to use the international police agency Interpol to arrest former Pakistani President Pervez Musharraf in connection with the assassination of former Prime Minister Benazir Bhutto. “The government is moving for his (Musharraf’s) red notice,” Interior Minister Rehman Malik said, referring to the Interpol’s international arrest warrant. Malik made the announcement as part of a progress report of the four-year-long assassination probe that was presented to provincial lawmakers Tuesday in Bhutto’s home province of Sindh. The briefing lasted several hours and was broadcast live on Pakistani TV. Bhutto was assassinated in a gun-suicide attack in December 2007, shortly after she came back to Pakistan from self imposed exile to take part in the 2008 general elections. Malik and the head of the investigation team said former Pakistani Taliban leader Baitullah Mehsud plotted the assassination and paid the equivalent of about $4,500 to a network of Islamist militants to carry out the killing. Using a Power Point presentation, pictures and video to outline the evidence they had gathered, authorities said Mehsud had Bhutto killed because she supported the west’s war against Islamist militants. Investigators said they collected much of their evidence from the accused plotters’ cell phone records before and after the killing. Last November a Pakistani court charged five alleged Islamist militants with aiding the suicide attacker and two senior police officers for failing to provide adequate security. Musharraf has also been accused of failing to protect Bhutto. 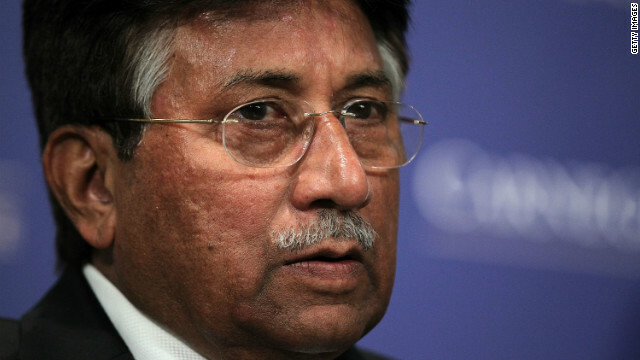 In February 2011 a judge issued an arrest warrant for Musharraf after he didn’t show up to court for questioning. Musharraf has been in self-imposed exile ever since he left Paksitan in 2008. Last August authorities confiscated his property in Pakistan and froze his bank account. The former military ruler has denied having anything to do with Bhutto’s killing. In Tuesday’s briefing Malik and investigators said Musharraf rejected Bhutto’s request to use a western private security contractor for protection when she returned to Pakistan. They suggested Musharraf intentionally left Bhutto vulnerable because he felt politically threatened by her return.